Friday nights at Tribeca may be my favorite time in SL. Calli is a fantastic DJ. When she is at TriBeCa she spins an eclectic set of vocal jazz, although that’s mostly a starting point. We have ranged far and wide from that jump-off. The other wonderful thing about Friday nights at Tribeca is that Calli can’t tell time. *grin* So although she is booked from 7-9pm SLT, we have NEVER EVER stopped at 9pm. Oh fine, maybe once. But I don’t actually REMEMBER that. I’m merely conceding that it is possible. 🙂 Last night her sense of time was even more dilute than usual, which is as it should be for a celebration. We did miss some of our regulars (and you KNOW who you are and you KNOW that I will scold you) but there were many new folk who joined in. Conversation is usually lively and interesting. Like the music, we head down some interesting side roads. Eva Cassidy’s “Over The Rainbow” had finished playing and Louis Armstrong’s “What a Wonderful World” began. Tor Karlsvalt commented that it was a really good song for SL. Then he added: should be an anthem. I think that’s brilliant. In so many ways, this song sums up what SL is for me – a wonderful world. It was a wonderful, magical, lovely evening. For those of you who weren’t there, please come and join us some Friday at TriBeCa Blues. For those of you who were there – thank you thank you thank you. Wishing you and yours a happy healthy new year to come, filled with joy and success. Then we head to my place so Bamboo could light OUR Chanukiah. I remembered to set the sky to midnight so that the flames show. 🙂 The beautiful Chanukiah was made by Lalo. We will be celebrating the Festival of Lights for another 7 days! I need to find a dreidel for ‘Boo, and some dark chocolate gelt for me!! My sister sent me this link on how Christmas would be celebrated if it were a JEWISH holiday. *grin* If you have ever studied Talmud, you will appreciate this post and recognize the style. If you have not studied Talmud, this may give you some insight into how the Rabbis really HAVE decreed every little blink of an eyelash for observing Jewish life. My personal favorite is the stricture that allows you to have a miniature tree but ONLY IF you also put toy people around it so that the tree appears tall. *grin* Keep in mind folks, should you follow this link, that it is intended in good humor and gentle fun and no disrespect intended. I write the most brilliant, insightful, pointed posts for my blog when I am tossing and turning, trying to fall asleep. I see the whole subject, outlined, clear. The prose flows. I have written on human nature, the difference between men and women, truth, justice, the American Way. *grin* Then I fall asleep finally. Come the morning, the page is blank. I’m sorry. Last night I was prepared to reveal the essence of male/female dialogue. Today – I need a nap because it took me forever to fall asleep. OMG!!! The last 12 hours have seen an influx of unexpected gifts in my life. One is easily explained. *grin* My husband was multi-tasking, doing things in a hurry and shipped our gift to his mother to OUR house. *laughing* I KNEW the free shipping was too good to be true. Then there was this little box for me – a Chanukah gift. A candy-coated caramel apple from Amy’s Gourmet Apples along w/ 4 chocolate truffles. No card. I called Amy’s to find out the name of my benefactor. They said there was a piece of paper included that said “Fulfillment Center”. Well, yes, but what does that MEAN???? Apparently it’s some bank or other company program. You accumulate points, can pick a gift with those points and either claim the gift for yourself or send it to someone else. I seem to be the someone else, but I have no idea who to thank for the generous thought and yummy gift. 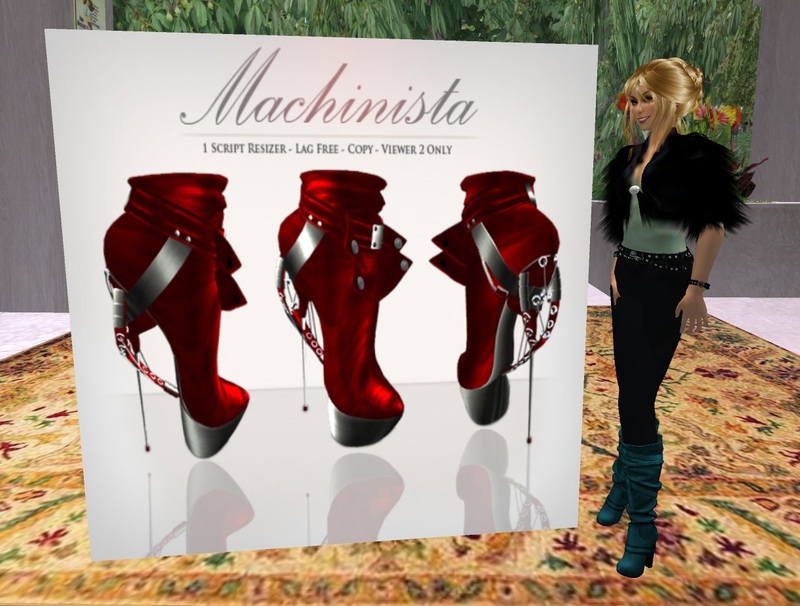 This morning I logged into SL and received a box from Xstreet SL: A Magic Box from Mahalee Breen – the Machinista All Red Viewer 2. OMG!!!!! LOOK AT THEM!!!!!!! AREN’T THEY GORGEOUS!!!!!!!!!! They are from Carmen’s Shoes. Who loves me??? Who do I thank? Yet again – no card was included. And I LOVE LOVE LOVE them!!!!!! Oh I WANT these shoes in EVERY life I lead. Thank you thank you thank you!!!!! Started the week with a rezday (Lalo’s) and ended the week with a rezday – Marx’s. They both turned FOUR. Wow. *grin* Sooooo much older than I. 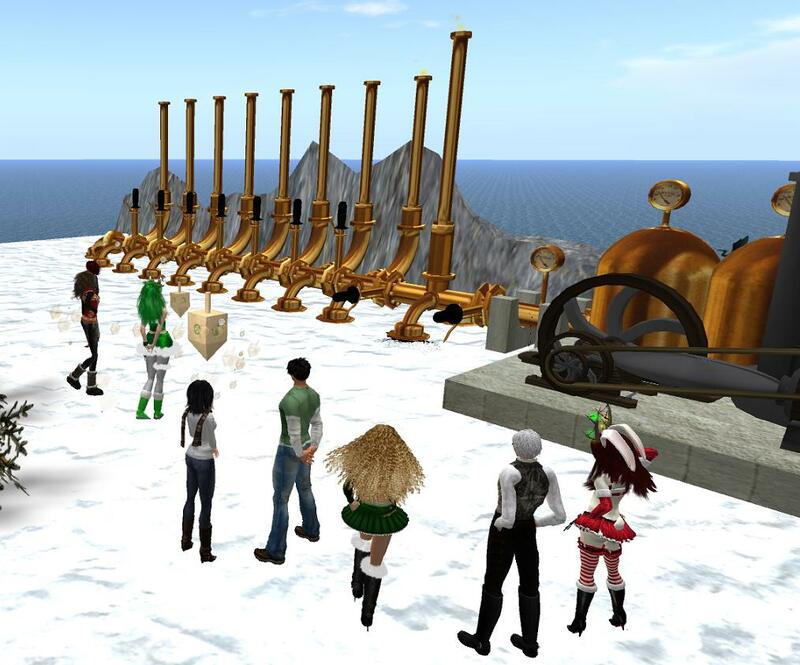 🙂 Marx spun the tunes for us and we all gathered at The Listening Room, now in its new location in Edloe. Besides the fun of the tunes Marx played and the good-natured and, occasionally, erudite, banter, I got to see some friends I’ve not seen in AGES. Had a nice long chat with someone, which is always good for the soul. Lalo and I have re-sync’d our schedules the last few days and have been dancing. Yesterday was his rez day. We celebrated by going to Fogbound, one of our favorite dance venues. We think they have the best dances. 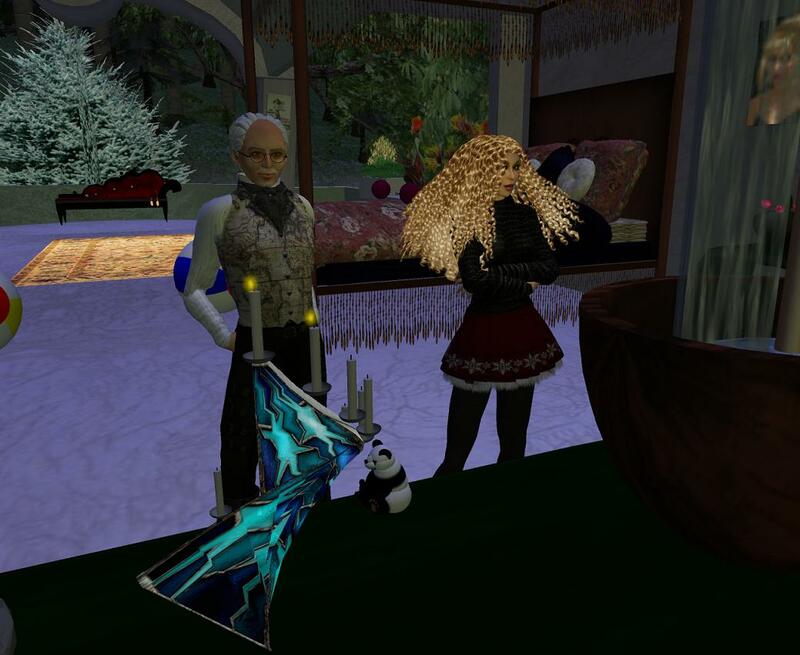 It was a lovely relaxing evening, and Evanrude Anton was totally hot in his DJ’ing. Or when it’s the blues do I say “was totally cool in his DJ’ing”? Whichever. Evan had one great tune after another. It was a lovely way to celebrate a rez. Tonight we got inworld just in time to catch Taunter’s last 3 songs. And she sang one she learned at my request: Leonard Cohen’s ” Dance Me to the End of Love. Ah, that was lovely Taunter. Then we headed back to Fogbound to dance to the blues. Evan was DJ’ing again, stylish in his stocking cap. As you can tell by the pics, just your typical weeknight crowd down at the bar. 🙂 Everyone loves relaxing at Fogbound. We interrupt this blog for a word from our atomic avatar….